Are you moody? Sad? or happy? Well, whatever feelings you have, Moodagent is always here to rock your mood. The new app in the block is the Moodagent, formerly known as Plalist Dj, by Syntonetic. A multi-platform app, just like Angry Birds, that catered the music life of ours to your phone. Nokia Betalabs is currently putting the new kid on beta version for Nokia N8 users to try (S60 5th edition in Ovi Store). And yesterday, they hit the updated version of the app which brings a big bugs fixed and some added functionalities. 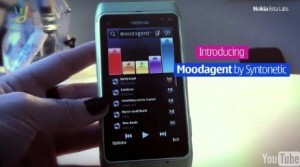 So what is Moodagent? It’s a music app that gives you the freedom to create your own music playlists based on your preferred moods. It either a happy go lucky one, bored, angry or what ever blends that you can make from five (5) different moods. It works to the profiles of the tracks that were actually collected online and used in your app. In short, it matches in your moods. The apps also features extensive options to your playlistings. To get more out of it, let me show you through bullet form. So far I’m enjoying the Moodagent experience but there are still few features that you won’t have. Better if I listed these too on bullet form. Like I said, the application is still on beta state and there are still big room for improvements for those Nokia N8 users. And I really recommend to all N8 users to try this one.